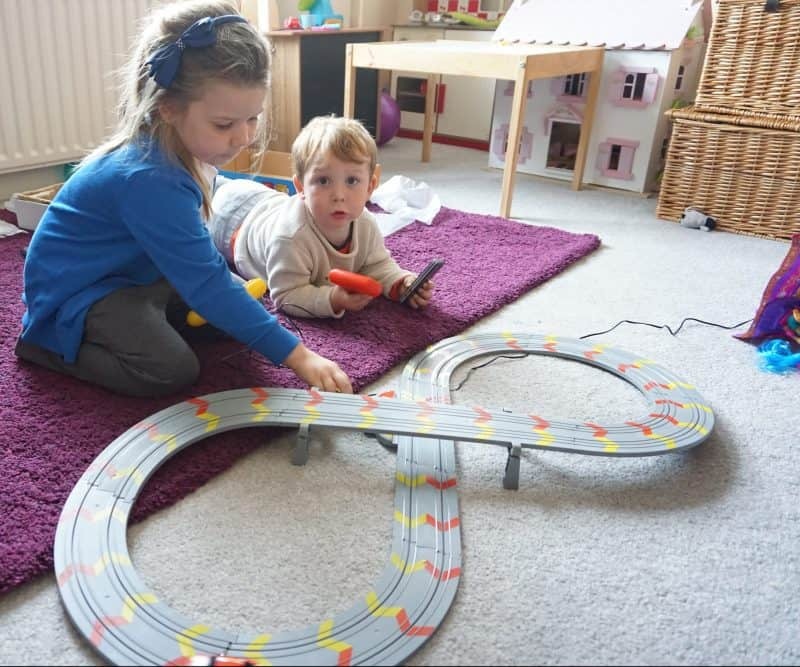 It’s no secret that Arlo loves anything with cars, wheels, or tracks and when the new My First Scalextric arrived last week he was pretty chuffed! Designed for little racers from three years and up Arlo got the hang of it pretty quickly, though he is a little under the lower-age at 2.5. Athena at four also enjoys playing with it though they both needed a bit of help clipping the track together in the right way. 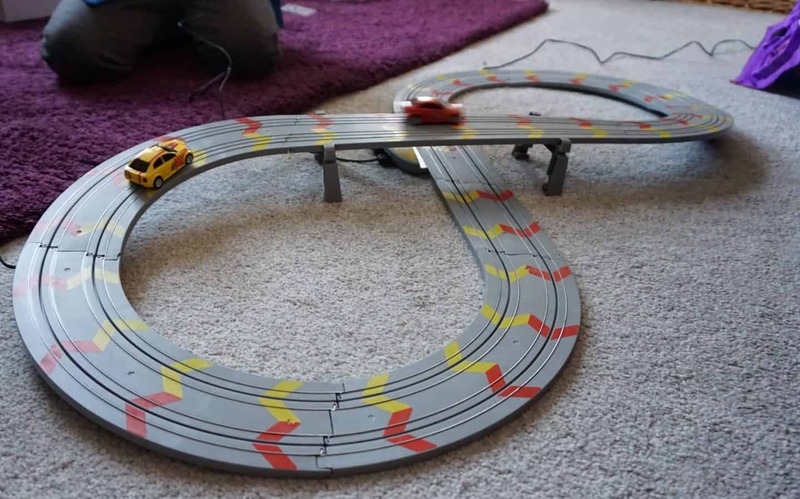 You need to ensure the coloured arrows match on on the track all the way round, and the little stands to raise the track are a bit fiddly for little fingers. However with my help it didn’t take long to set up out of the box, under ten minutes for sure, and even less the next time we played it as we were more familiar with the set up. 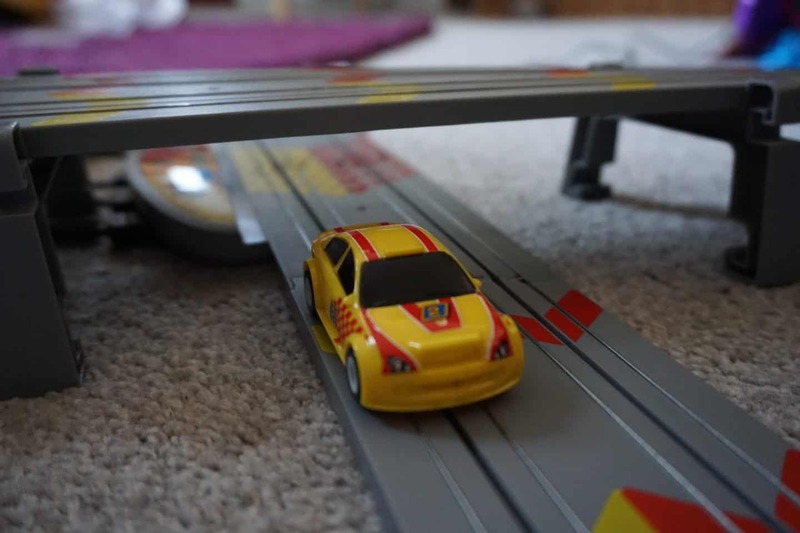 The My First Scalextric needs plugging in, which is ideal as you don’t need to find batteries, and there is a cable that runs from the plug to the one of the track pieces, then each controller has a cable too. What I thought was really clever about this set is that the speeds on each hand controller are adjustable, meaning you can limit how fast your cars whizz round the track, meaning less chance of them crashing! As you get more adept at slowing down and speeding up for bends you can up the speed make it a bit more fun! 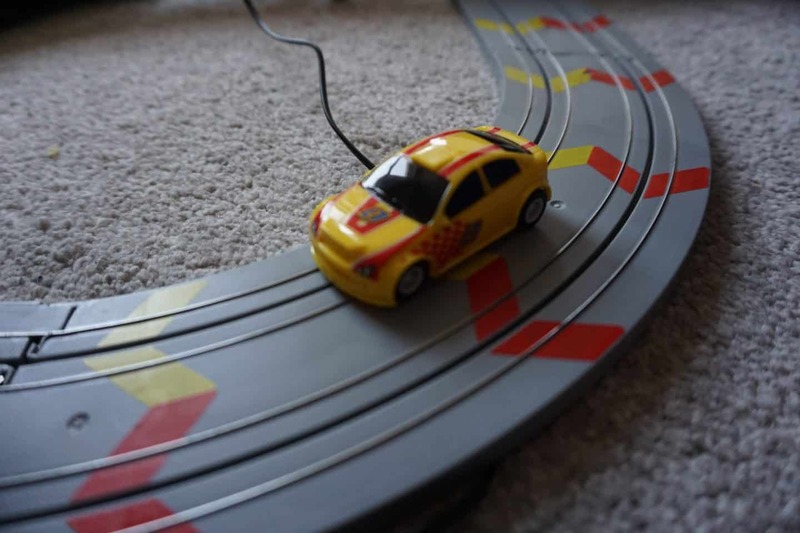 If you’re unfamiliar with how Scalextric works then the little cars sit in a groove that runs around the track and two wire tabs underneath keep contact with two metal rails and that keeps the electricity flowing and the cars race round! It’s kept my two occupied for hours on end since it arrived, Athena counts the laps they do, and Arlo often lines up his toy cars around the edge of the track to act as spectators! You can buy the set here as well as checking out all the other sets from Scalextric! This set is compatible with the ‘Micro Scalextric’ sets you can expand it for even more racing possibilities. We were sent this toy for the purpose of this review, all words opinions and photos are my own.